Every home can use some large wall art, don’t you think? 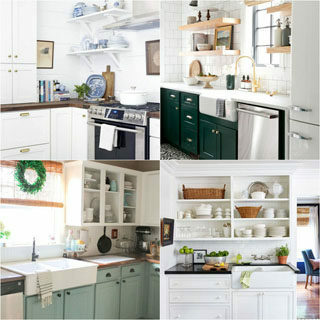 We are in the middle of a remodel, and I am already thinking of all kinds of wall decor and wall art ideas! 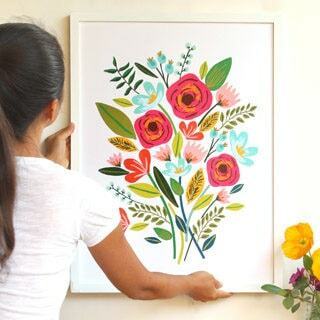 Large wall art can make such a big impact in a space, but it can be hard to find unique and beautiful framed wall art prints that are just perfect for your style and budget. 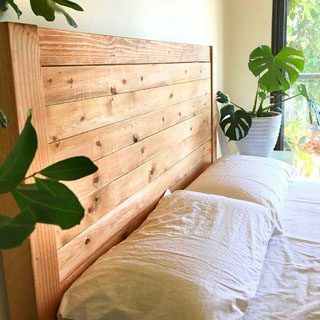 This is when DIY Anthropologie style becomes a great option. Can’t paint? No worries. Can’t print on large scale? No problem. 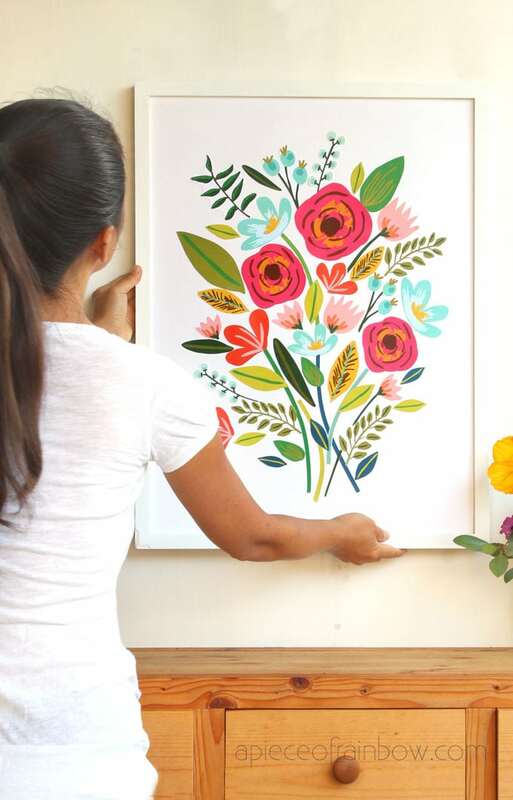 This incredibly easy DIY large wall art takes only $5 (frame included!) and 1-2 hours to make. 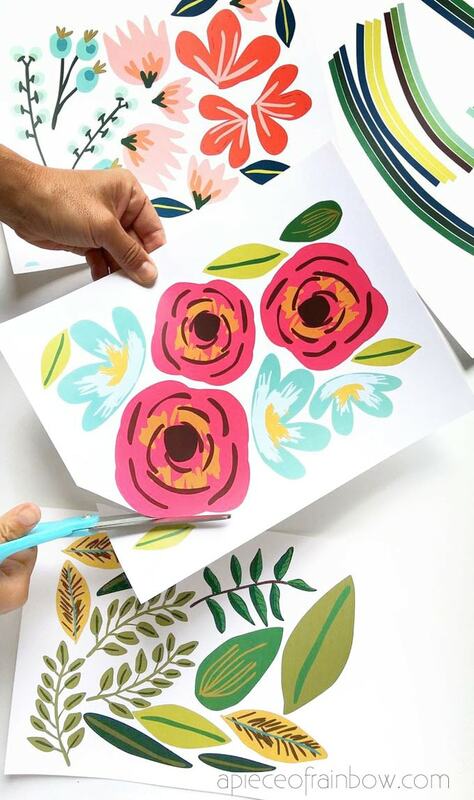 I will share with you all the techniques, tips and tricks, as well as the free printable designs, so you can make your own beautiful unique framed paper or canvas wall art for your home and to give as gifts! 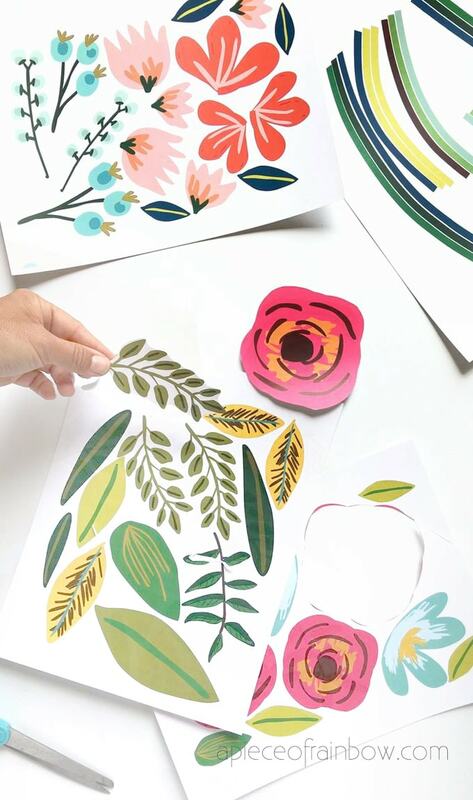 This 8.5″ x 11″ 110 lb card stock is great for the flowers and leaves cut outs: it holds its shape and is really easy to work with. And a home printer, either an inkjet printer or a laser printer will work. large poster boards like these: you can get large sheets of them in a pack, and they cost only about 50 cents each! frame: the frame I used here is 18″x24″. 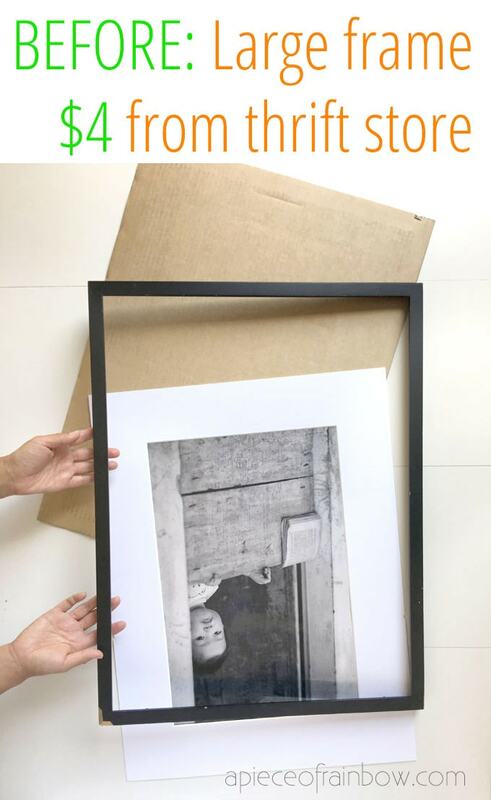 I have a secret 🙂 on how to get large frames at a fraction of the cost, see Step One below! glue or decoupage medium. I used this DecoArt 16-Ounce Decoupage Glue in Matte Finish. I love it because it’s non-toxic and acid free, which means non yellowing. Step 1: Find a large frame. Ready for my secret? Thrift stores are the best places to get large wall art frames! Look for frames in good condition, you can always paint them with the colors you want. I was able to find two of them easily at a Salvation Army for $4 each! I painted the black frame white, which look right at home in our living room. 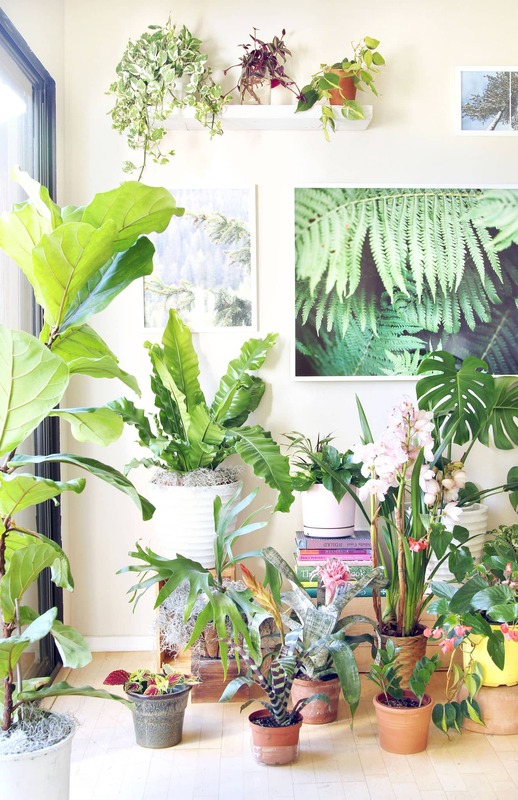 If you are interested, you can check out our living room wall makeover here, and a list of our favorite easy care indoor plants here ! You can download the free designs at the end. There are a total of 4 pages. 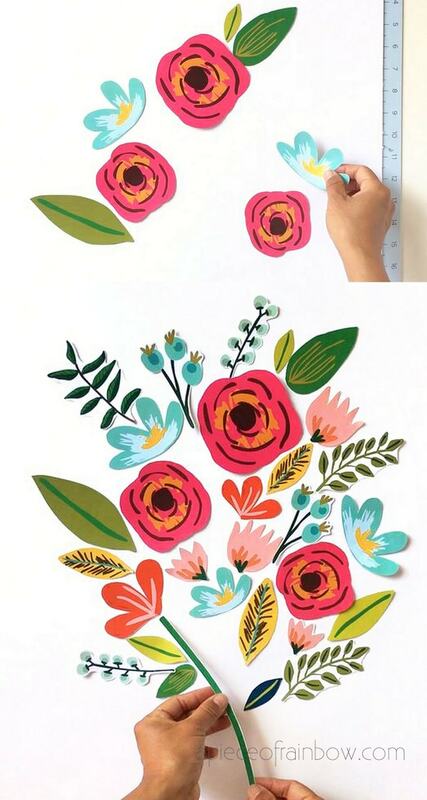 To cut simple shapes like the large flowers, just cut along the outline. 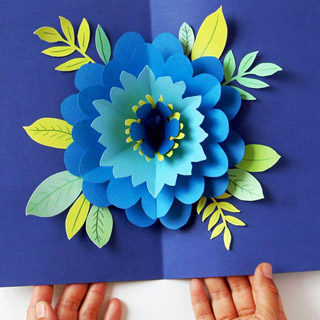 To cut more intricate shapes such as a cluster of berries or leaves, cut a shape surrounding the whole cluster, because the white paper will blend in with the white background. If you are creating this on color poster boards, then you will need to cut away the white around each element. Time to improvise! 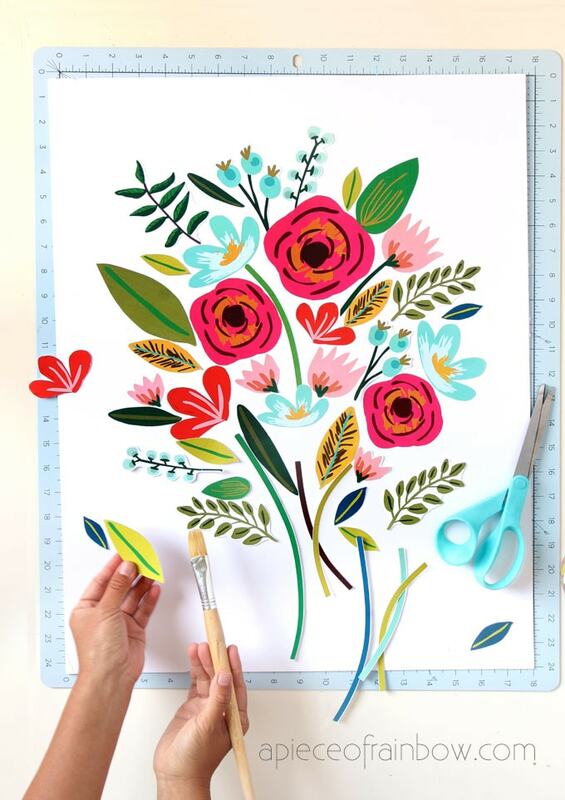 Don’t glue anything down yet, just place the elements on the poster board paper and shift them around to create a huge bouquet. Check out the video tutorial above if you want to see it in action. 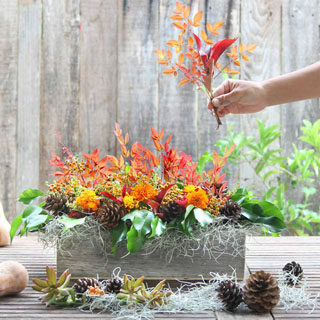 I find it easier to start with some flowers first, then some leaves and berries, and finish with the stems and more leaves. Once everything looks good, start the gluing process. Oh wait! Here’s a tip: take a picture of your bouquet so if for some reason things get shifted ( by your adorable kitty or some mischievous wind ) you can have a reference. Brush a thin layer of … on the back of each element and glue it to the.. I started again with the main flowers, but you can start anywhere. 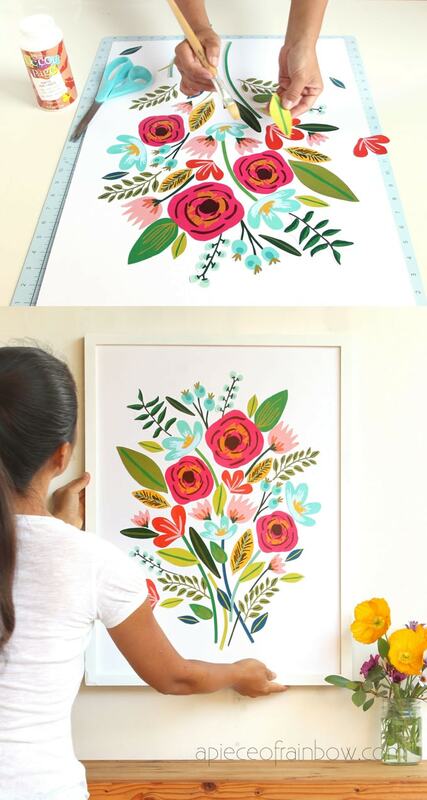 When you get to the stems, you can cut the larger stems shorter or narrower to fit your wall art composition. This step is really easy and fun. 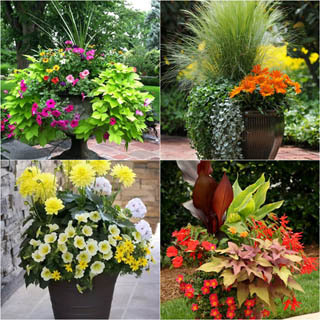 It is exciting to see a huge bouquet of flowers taking shape! 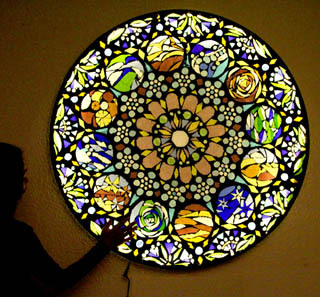 Once it is finished, let dry for an hour, and put it inside the frame. 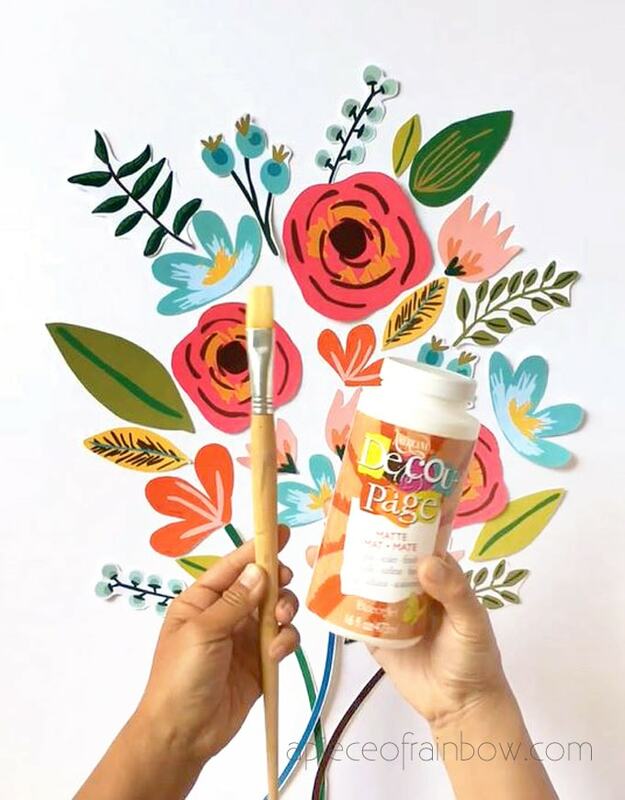 If you create your wall art, tag us on instagram at @apieceofrainbow, we would love to see it! 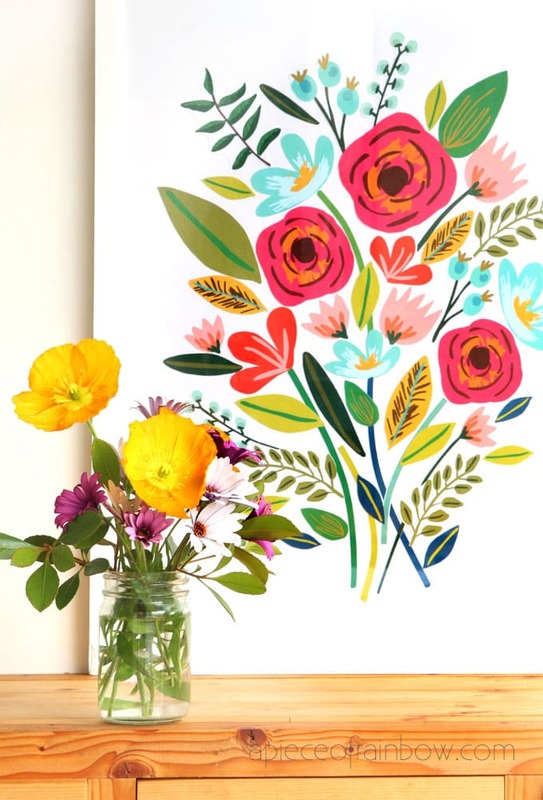 You can use this technique to create canvas wall art. Just get white primed canvas or paint an old canvas white. 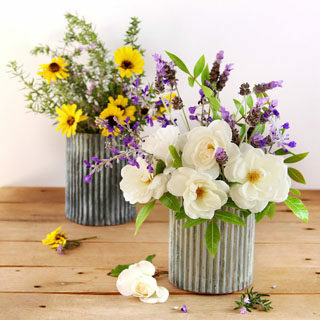 You can also use this technique with your own painted flowers. 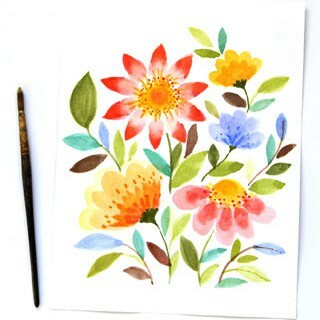 Anyone can paint flowers! 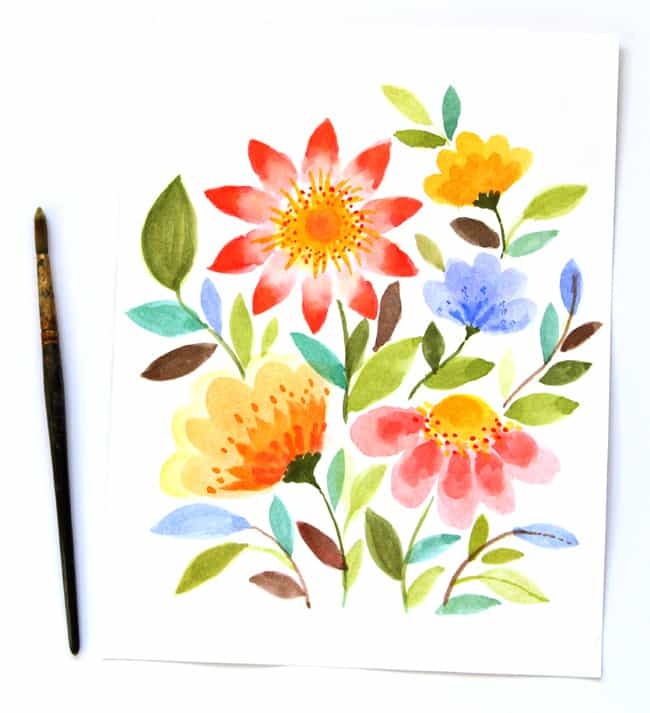 Here’s a tutorial on how to paint beautiful watercolor flowers in 15 minutes, no art experience required! Want more wall art ideas using thrift store frames? 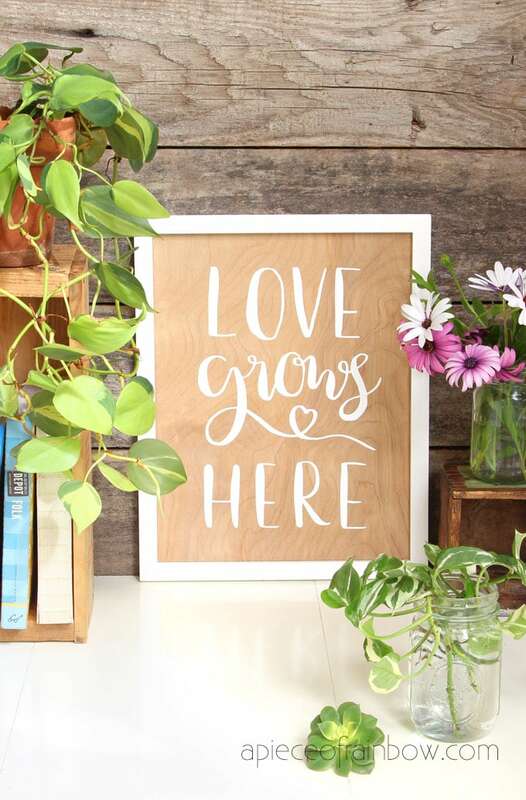 Check out how to create hand lettered quotes on wood! 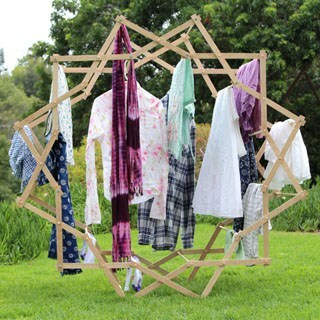 Love it and will be making at least two so thank you ! 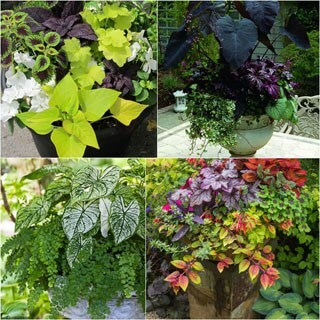 I have been a subscriber for long time – wanted to down load the 4 pages of flowers to make my bouquet picture but there is not a button to do that page and to do that – just a panel that takes me to subscribe page. Help!